Today I finally received my HD-DVD drive!! I wasted no time unpacking it and setting it up to see some High Definition awesomeness!! All in all as you can tell the package is very nice looking!! I first opened up the package to find all the goodies inside. Everything was well packaged. There was no empty space for things to get bumped around and broken. Everything was wrapped in plastic bags for protection against moisture. -A USB cable to hook the drive to your Xbox. -A nice Media Center Universal Remote. After you hook everything up with a simple USB cable you are ready to go. 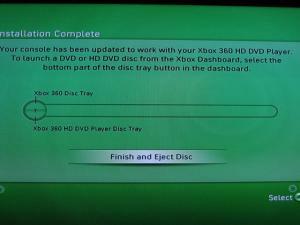 A installation CD comes with the drive to update your console incase you don't have Xbox Live. For me the installation took only seconds! I was also easily able to get the universal remote to work with my Panasonic LCD HDTV after I looked up the codes on the internet. Sadly, there was like 20 codes for Panasonic but I got lucky and found the right one within the first ten. Here is what the system looks like once you have it all hooked up and ready to go! It is actually larger than I thought it would be, but then again it has a lot to do! 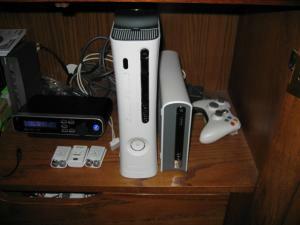 This is actually the first time that all of the Xbox360's processing power is used!! So, as you might guess it does make some more heat while you are playing movies. You might think about investing in the Intercooler device which helps to pull more hot air out of the system. The down side to it is that it does make the system slightly louder! But what do you care, if you are running HD-DVD's you probably have a 5.1 surround sound system blasting away at movies anyways! 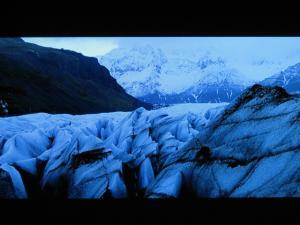 Here is a screen shot from Batman Begins, I know it does not do anything justice so you will just have to take my word for it! I must say I was slightly worried about buying this product since the 360 has no DVI or HDMI connections. It does have VGA cables that you can buy which currently is the only way to be able to get HD 1080p out of the system. However, my TV only runs at 720p so using the component video cables worked just fine. As soon as I saw the first frame come out of this beast all my worries were laid to rest!! 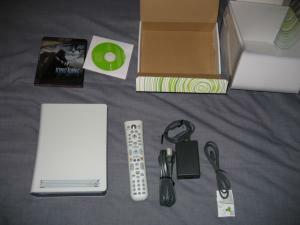 Microsoft has truely brought HD movies into the console world for the first time!! It might of taken an extra 4 million lines of code being added to the 360's software but it was well worth it! All this code had to be written new due to the IBM Power PC that the 360 uses. So far I have watched all of King Kong, and parts of MI3, Batman Begins, Under Seige, V for Vendetta, and U-571. All of them have looked really great!! The sound I was also able to tell a difference in since I have a dolby digital system. The surround features seem to stick out a little more which I like. Luckily sound isn't a problem with the 360 since it has a optical port on the back which I utilize. For there being such uncertainty in the market over which format is going to win Blu-ray or HD-DVD consumers are downright affraid to buy these products. However, if you have a Xbox360 and a HDTV already you owe it to yourself to buy one of these drives! The movies are only 5 dollars more and you truely do enjoy the movie experience far more then a DVD. Why waste money on buying dying technology. Even if HD-DVD loses the war you will still be able to buy dual format readers in several months so choosing a format really isn't as big a deal as many would think. WOW!! Very nice chris! makes me want one! It uses USB, does it work on your pc? Sadly no, since the code was written for the Power PC chip. So, unless you have one of those around....hehehe. It sure would be cool if it did though!! I bet it won't run on a MAC either. What did you expect, it is made just for the xbox. Oh yeah, I think several companies are working on drives for PC's that will run Blu-ray or HD-DVD. The problem there is there aren't many monitors out there with HDCP support yet, let along a HDMI port. 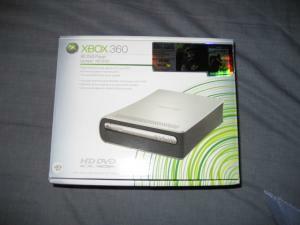 Hacking the XBox 360's HD-DVD for the PC. That is awesome!! I downloaded the drivers and will see if xp x64 see's it or not! I will let you guys know in awhile! As for the software I am not going to buy it since there is no point! I wouldn't watch these on my pc anyways. I'll wait for something free.